Choose from four varieties of wild Lip Balms! Category: Bath & Body, Skin Care. Tags: balm, chapstick, lip, lip balm, natural chapstick, natural lip balm, organic chapstick, organic lip balm. Treat your lips with these Natural Lip Balms! Enjoy the natural scent and texture of Natural Lip Balms. Handmade with wildcrafted herbs, blossoms, and seaweed from Canada’s Northern wilderness. I can’t say enough about the lip balms and herbal face scrub! My skin and lips have never been so soft. 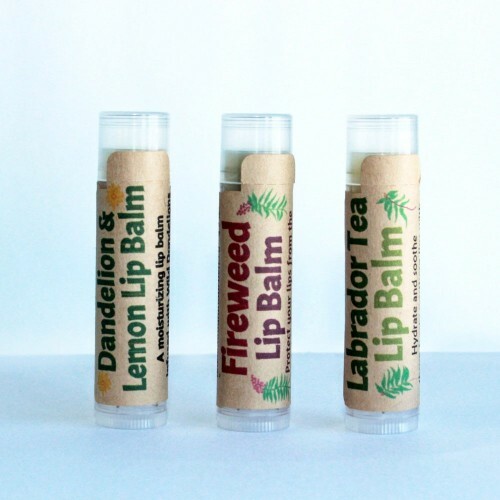 My personal favorite lip balm is the Labrador Tea / Rosemary. Keep up the good work, my skin needs you!!!! Very moist,stay long and make your lips glow.My fav is fireweed/vera.